We observe many customs and traditions for Easter, some religious like attending Sunday mass, others less so, like searching for eggs left by the Easter bunny. Whatever the case may be, one thing about Easter is certain, that it is a holiday when friends and family come together and that usually means a nice family dinner. Since Easter is a holiday of rebirth and rejoicing, you must make sure that your dinner table is suitably decorated, and the most common decorations are flowers, greenery, colorful eggs and bunnies or chicks. 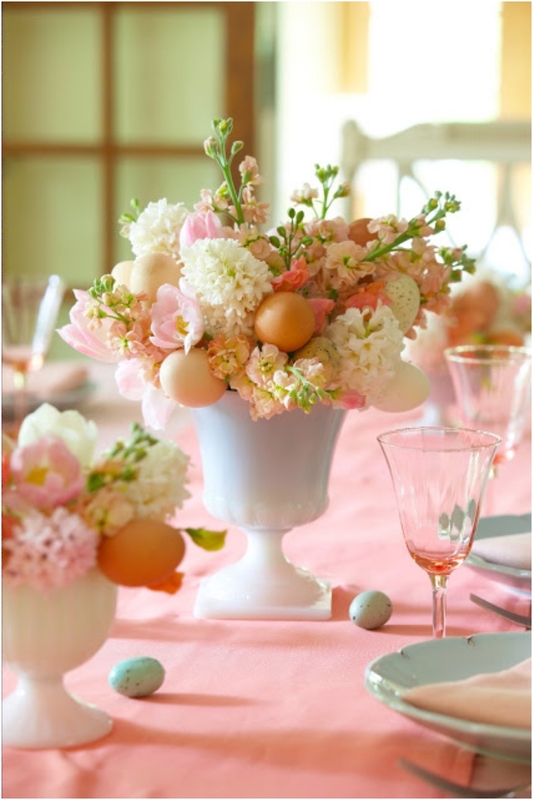 If you have problems deciding how to decorate your dinner table, take a look at our Top 10 fabulous centerpieces that will help you bring Easter to your home and table. When we think Easter, fist we imagine eggs and Easter bunnies, and afterward we think of the true purpose of Easter, which is a reminder that Jesus Christ rose from the dead, after being crucified on Calvary Hill. 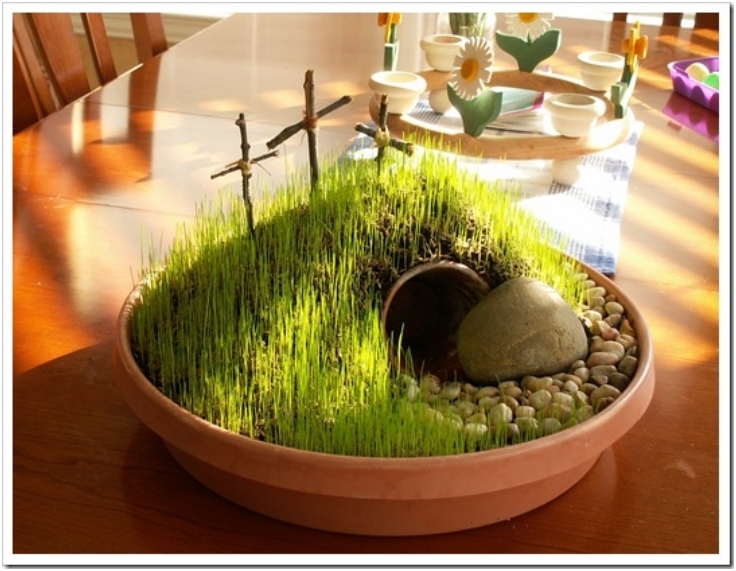 If you want to remind your dinner guests of this, make this Calvary Hill planting as a centerpiece for your table. It will certainly make an impact. Carrots might be good for decorating your dinner, but they wouldn’t be your first choice for decorating your dinner table, unless you use them like this. 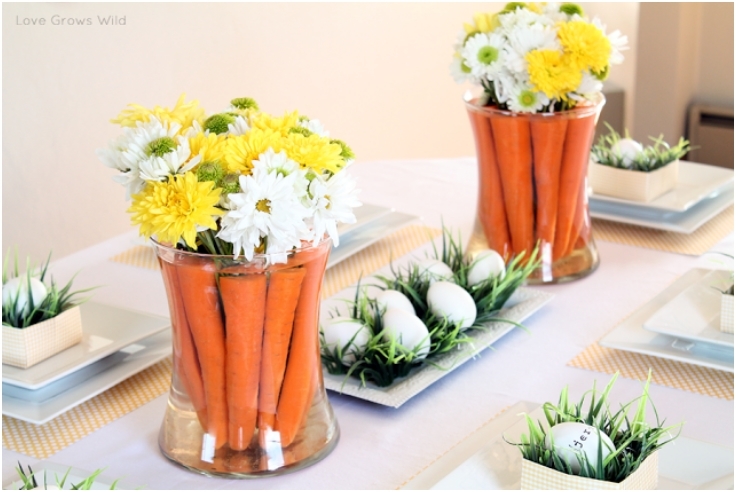 Submerging flowers in clear glass vases is lovely, but keeping in line with the Easter theme, you could submerge carrots and place flowers atop them. The end result is simple, yet eye-catching. The simplest way to decorate your table is with a colorful flower arrangement, but flowers alone don’t exactly screams “Easter”. 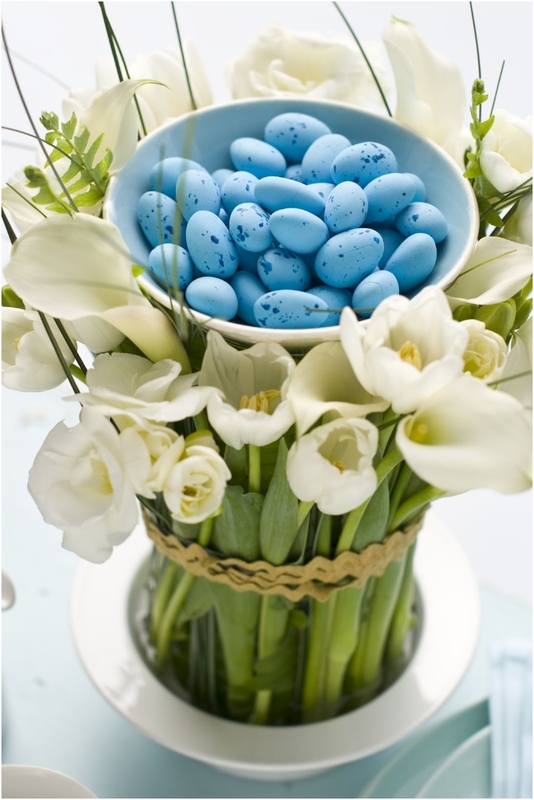 So, to make your elegant and classy flower arrangement more suitable for Easter, just put some decorative eggs to it, matching the flowers, and you’ll have one great Easter centerpiece. Sometimes, the problem you face when decorating is not what decorations to use, but where to put them. Having a nice vase or basket is as important as the decorations, and if you’re looking for something truly unique that won’t cost too much, this string basket might just do the trick. After it’s done, you van fill it with eggs, flowers, bunnies or whatever you’d choose. Topiaries make adorable centerpieces, but sometimes they are simply over your budget or you can’t find the one you need. Fortunately, there are blank styrofoam cones you can easily make into amazing topiaries for any occasion. 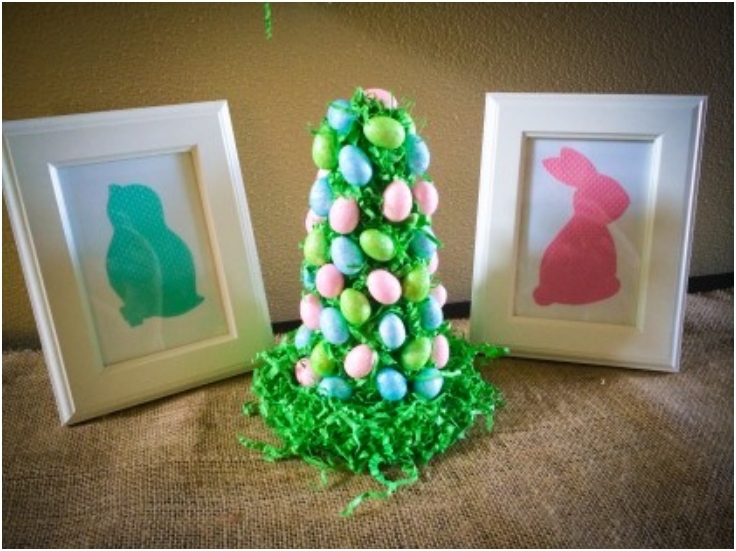 For Easter, all you’ll need are some decorative eggs, some Easter grass or grass imitation and a glue gun, and you’ll have an Easter topiary in minutes. Shaping a shrub is impressive and it requires a lot of skill. Bring that amazement to your dinner table without even using scissors. 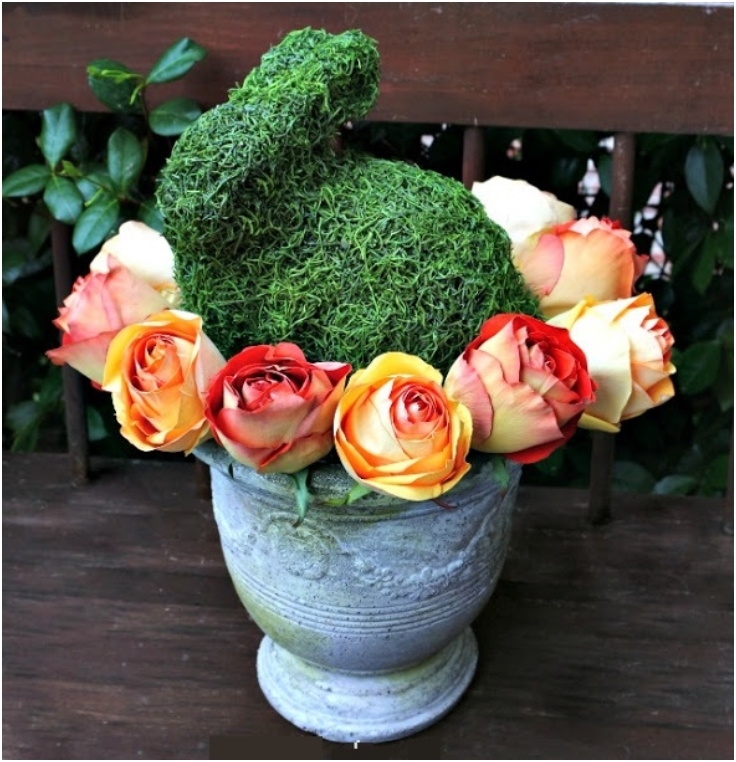 This green bunny that looks like a shaped shrub over a bed of roses is a true spring image, and all you’ll need is an old bunny toy that you can cover with fake moss and place in the middle of your rose bouquet. 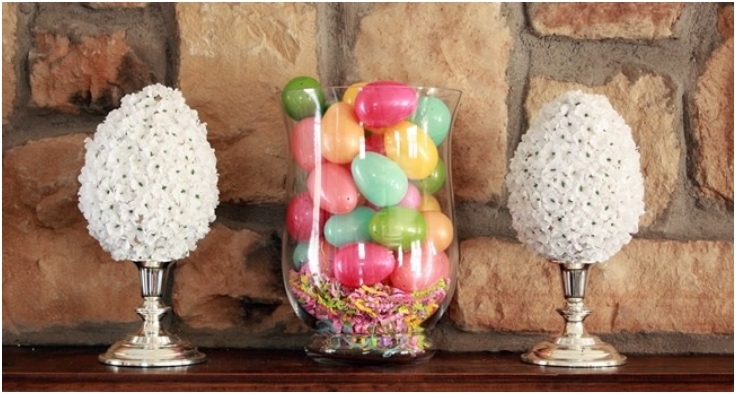 There are countless decorative Easter eggs, but this one will serve you not only as a great Easter floral centerpiece, but also as an excellent mantel piece and the best part is that is very easy to make. Just glue some flowers to a paper mache egg and after you’re done, display it on a fancy looking candlestick. Nothing brings warmth and closeness to an atmosphere like some candlelight. 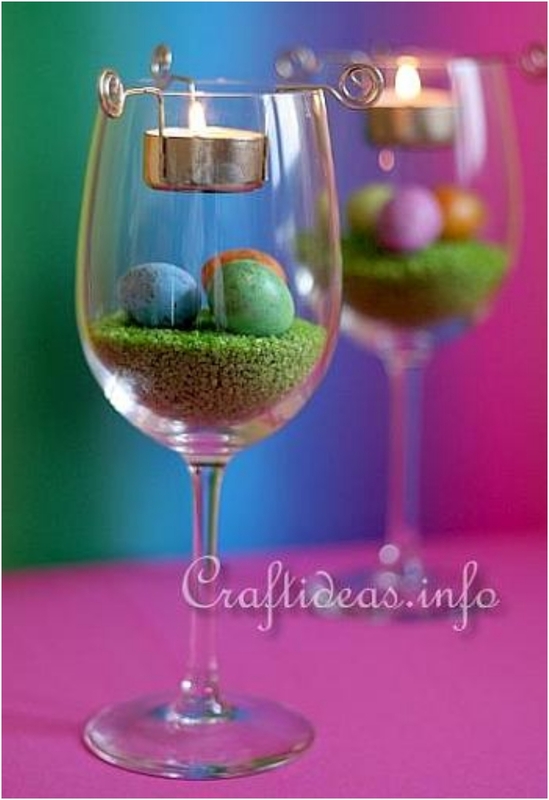 These cute little centerpieces will decorate your Easter table and won’t take much of your space, since they take up as much space as a glass. Make your tea light centerpiece with straw or colored rocks and enjoy a peaceful candlelit dinner. Arranging flowers in a vase in a way t look good can be a bit difficult for some, but arranging them outside the vase is a lot more easier. You make easily make this flower arrangement by wrapping the spring white flowers and greenery around the cylindrical vase and placing a bowl of colored eater egg atop it. It is that simple. 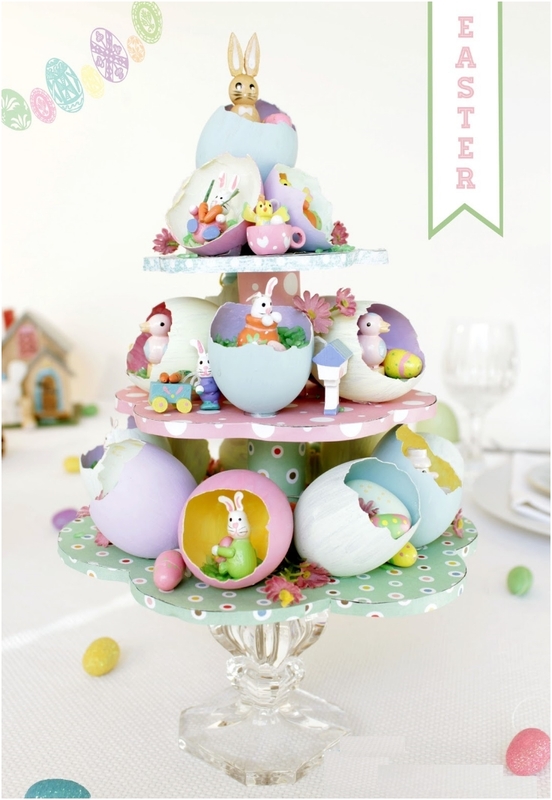 For our last Easter centerpiece idea we suggest this whimsical Easter tree, made with tiered cake stand filled with real egg shells and miniature bunny toys. It is truly a fun and lovely decor piece that has Easter written all over it and is great for the kids table and the adults table alike. 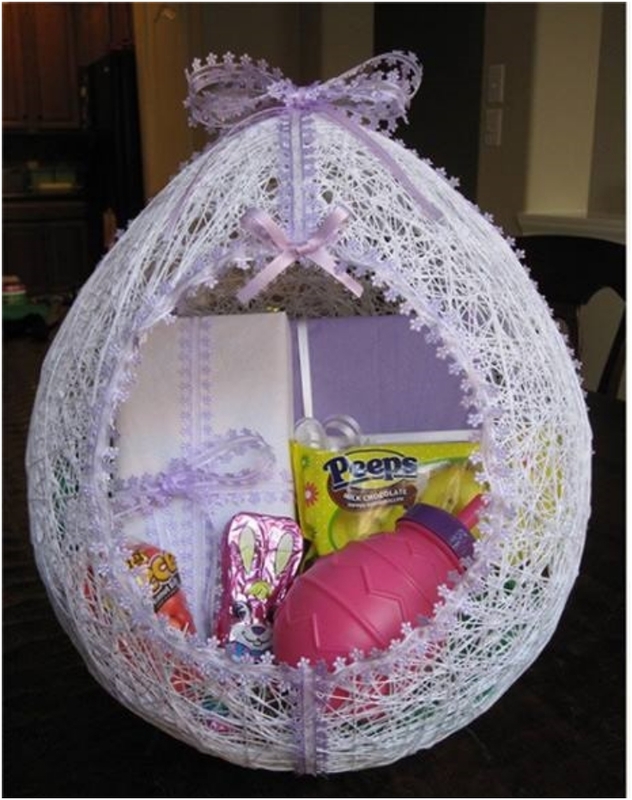 And if you think that it is too child like, you can take the basic concept of this centerpiece and add nests, flowers and eggs to make it look more chic.